I have written about this before, but here is the official news reblogged from the SFB 716 website. At the end of October, the largest conference on scientific visualization – the IEEE VIS 2015 – took place in Chicago. This is an anual venue for experts from all over the world to present current research and discuss future challenges. With more than 1100 participants, the conference is considered the largest and most important international forum in this domain. 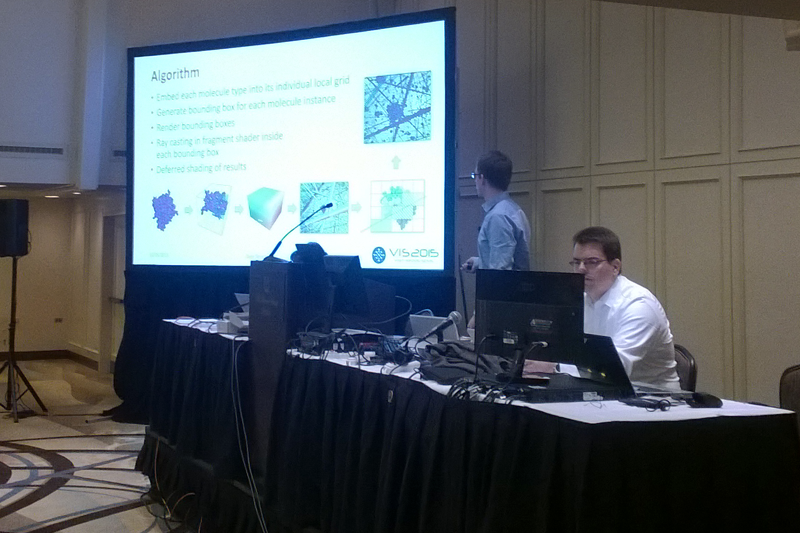 This year, Michael Krone and Guido Reina from the group of Prof. Ertl, together with Sebastian Grottel (TU Dresden) and Martin Falk (Linköping University, Sweden) organized a tutorial on interactive GPU-based Visualization of large particle data. They explained the technical aspects for ensuring high quality and interactivity of particle visualizaton, which are nowadays accepted as state of the art. Part of these techniques have been developed in the SFB716. Additionally, the presentation included details on abstractions required by continuosly growing data sets. Such abstractions were disucssed in the context of biomolecules and material surfaces as well as in the context of whole cell visualization. The tutorial was very well received with over 50 participants. The course materials distributed there, including slides, source code and example data sets can be downloaded here.